It was during Chanukah, four years ago. 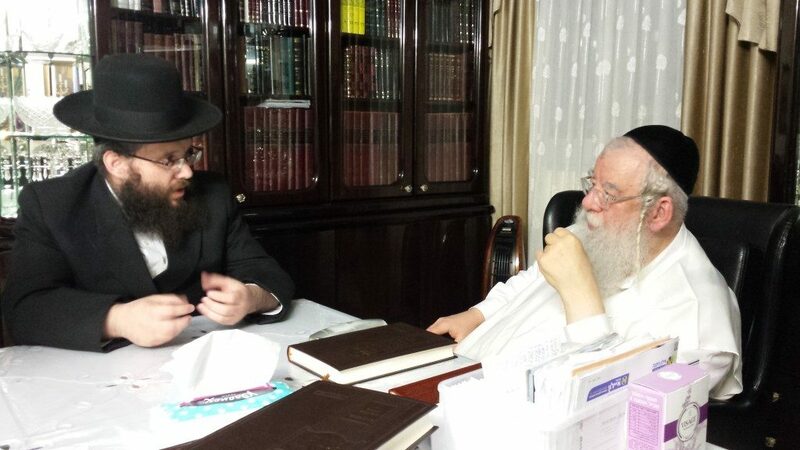 I visited the home of the leader of Khal Adas Yerushalayim, or as it is known, the Masmidim, Harav Leibel Mintzberg, zt”l, and I had the privilege of having a rare conversation with him about chinuch. Reb Leibel was an ardent ish Yerushalayim, and he wore the Yerushalmi garb, the chalat and hat during the week and the shtreimel on Shabbos and Yom Tov. His father, Reb Elimelech Mintzberg, Hy”d, came from Lithuania to Yerushalayim and got married. Then the War of Independence broke out and a siege was laid upon the city. Water was scarce, as was food. The Jordanian Legionnaires, who succeeded in capturing the Old City and the eastern part of Yerushalayim, launched merciless bombardments on the residents of the chareidi frontier neighborhoods. At the time, Reb Leib’s father was moser nefesh to bring water to his elderly and disabled neighbors who could not get to the distribution locations. One time, when he left his house to get water for a neighbor, he was struck and killed by a Jordanian mortar, leaving behind a widow and three orphans, including his five-year-old son, Leibel. The one who took the young orphan under his wing and raised him was Harav Yisrael Yitzchak Reisman, zt”l, the Raavad of the Eidah Hachareidis. Those were the early days of the fledgling state, when secularism raged and ensnared many of the youth. One of the most serious problems was that the yeshivos for the younger bachurim finished in the early evening hours, and the nighttime remained open. Instead of a third seder, which is accepted in yeshivos today, the youths made their own “seder.” They wandered like a herd without a shepherd in the streets of the city, and were exposed to a street culture that was foreign to them. They visited questionable places, and from there it was a quick slide to completely straying from the path. Among the youths in Masmidim back then, young Leibel stood out. He was known for the clarity of his thought and for his fiery enthusiasm, which was contagious. After a few years, while he was still a bachur, he was appointed leader of the entire chaburah, and from that point on, his name was synonymous with Masmidim until his final day. That was all he said. It was the Belzer Rebbe’s shmuess on chinuch. “What he meant to say,” Reb Leibel clarified, “was that at the time they used to do things sharply, and today they do it with sweetness. The sharp way has not proved itself, certainly not in our generation. Today it’s only with pleasantness. In the past, it was a combination of the left pushes away and the right draws closer. But today it’s only the right drawing closer. We have to elevate the student.